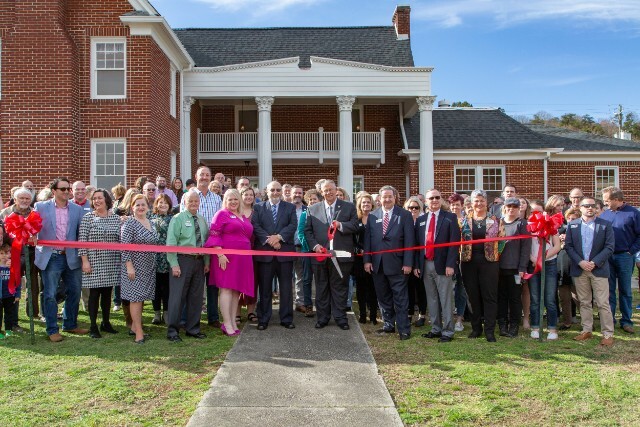 On March 15, 2019, the Gilmer Chamber along with community leaders, members and citizens had the pleasure of cutting the ribbon to celebrate the grand opening of the Downtown Welcome Center located at 10 Broad Street in Downtown Ellijay. The chamber was honored when the Board of Commissioners asked if our organization would use this beautiful and iconic structure to extend greetings and hospitality to our downtown visitors. It is altogether fitting and appropriate that the formerly private residence of a pioneer and progressive family be transformed into a place to welcome the public. We are proud to pay tribute and homage to Dr. Edward Watkins, Jr. and Mrs. Bessie Watkins for their profound generosity they displayed when they bequeathed the Watkins homeplace to be used for the good of the whole, as well as for their numerous other extraordinary and salient acts of philanthropy and benevolence to Gilmer County’s citizens. Through the vision of local leadership, this welcome center will be a front porch for Gilmer County and Downtown Ellijay. The welcome center will offer local information for visitors, meeting space, restroom facilities, and other various exhibits and events. The welcome center will be open year-round. Hours of operation will be seasonal and are currently Wednesday through Friday 10:00am – 4:00pm and Saturday 8:00 – 4:00pm. Hours will be extended during peak season and holidays. Be sure to like the Downtown Welcome Center- Ellijay, GA Facebook page or contact the Gilmer Chamber at 706-635-7400 for more information.